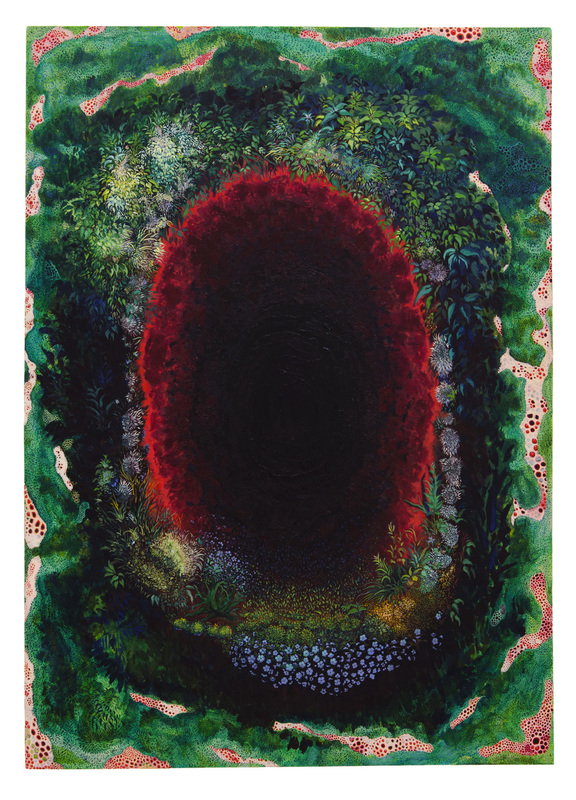 Kate Bickmore’s artwork is a stunning testament to her experience of the intersections of nature and her female identity—more specifically, the “sense of feeling both empowered and constrained.” She beautifully emphasizes the importance of exploration in creation; of allowing the wild plants to both bloom through and break down the canvas. Read on for more of Kate’s remarkable words of creative wisdom. Alison Znamierowski: How did you get started doing art? Kate Bickmore: I have been drawn to art-making ever since I could pick up a pencil. I used to walk around the garden with my grandma + draw the flowers I saw as she told me their names. I must have been about three or four. AZ: Were there any trends through the subjects of your art over time? KB: The power of nature has always really fascinated me. I am completely enthralled by wild plants + weeds that emerge in places that try to contain them, such as sidewalks or abandoned homes. That motif is recurrent throughout my work, as is the female form. I am attracted to the agency those plants have + see a lot of my female identity connecting to it. To me, they embody this sense of feeling both empowered + constrained. AZ: Can you talk about the different pieces in your senior project and the ideas behind them? KB: The two pieces I ended up showing in my final exhibition were The Abyss's Bridge + Hanakatoba. Both works were heavily influenced by my surrounding environment + how my body relates to or occupies that space. It was important for me to work on a large scale because I wanted the viewers to be engulfed by the work + feel as if they could physically enter this world that appears to be both real and fantastical. So much of the meaning behind my work comes to be in the process of making it. The canvas really becomes this site of exploration where one idea manifests into something else as the painting continues to reveal itself to me over time. The Abyss's Bridge (above) was really a portal to discovering my voice. For me it embodies a multitude of ideas + places: it's the Garden of Eden; it's the rabbit hole; it's Courbet's Origin of the World; it gazes back at the viewer with an urgency that is both alluring + unsettling; it has no beginning or end but rather is in a state of continual expansion. To be honest, I am still trying to figure it out. Hanakatoba (above) is a much more narrative painting than The Abyss's Bridge. During the process of making it I became infatuated by symbols, signs, what they mean + the role they play in our lives. The painting started to develop a language of forms that could appear to be or mean something else (such as the cracks existing as webs or the bricks being cosmoses). It also more literally depicts how I understood myself + where I was at that point in time. I felt surrounded by this very safe, fertile landscape; it was as if I had the whole universe at my fingertips. I knew I was about to enter into a more difficult phase in my life though-- a brick wall which I would need to confront. Unfortunately this has since proven to be very true! AZ: Can you speak a little more on the connection between your art and your environment? KB: The process of making my pieces has always been about synchronizing my movements or process of painting with that of my environment. I start my work by emulating washes of rain + soil as if the canvases were left outside for nature to slowly consume them. The wild plants then begin to grow— both emerging from and breaking down the canvas. I believe a painting, like flesh, is permeable + transient. I try to be cautious of this when making the work by bringing nature back into the painting not as a picture but as something that has agency over the canvas + is actively expanding or growing on it. AZ: Are there any specific practices you have to connect to self or environment? KB: Meditation has really transformed my life + artistic practice. I find few things as humbling as meditating in nature. The act of being physically present has become key to helping me gain a stronger awareness of the world around me as well as to experiencing + understanding my work. In terms of artistic practices it is important for me to do most of my preliminary sketches from life or from photos I take of things in nature that move me. I want the paintings to represent how I perceive my local environment or the plants I find in my travels. Many of the plants in my paintings are inspired by ones I see in the sidewalk walking to + from my studio. AZ: Are there any projects that you're working on now? KB: I just recently finished working on a large scale painting + am starting to piece together ideas for some new work. I usually find my productivity comes in waves of intensely working for a few months + then a long period of observing, thinking, + dreaming. AZ: Is there any advice you would give to young artists? KB: Follow your intuition + be open to everything.